Bronzes Riópar, is a company dedicated to casting in bronze, brass handicrafts and manufacture of bronze and brass. Specialized incasting and lost wax bronze sculpture. It has a tradition dating back to 1772, when it was founded the Royal Factory of San Juan de Alcaraz, first in Spain and second in Europe in the manufacture of such items. Our staff has real and skilled craftsmen, the result of this tradition of a people forged in this art. In each of our pieces is taken great care and expertise that gives them that handmade touch making them true works of art. During the course of our craftsmanship in bronze. 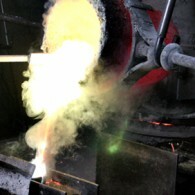 Our company has been noted for the quality of the technique used as casting or lost wax bronze casting.